Taking place at New Century Trust, 1307 Locust Street. This panel will be introduced and moderated by Justin Langlois and Gabriel Saloman, curators and co-creators of Neighborhood Time Exchange. The panel will include: Daniel Tucker, Assistant Professor and Graduate Program Director in Social and Studio Practices at Moore College of Art and Design; Prof. Rickie Sanders, Professor of Geography/Urban Studies and former Director of Women’s Studies at Temple University; Amber Art & Design including members (possibly Keir Johnston, Linda Fernandez & Ernel Martinez). 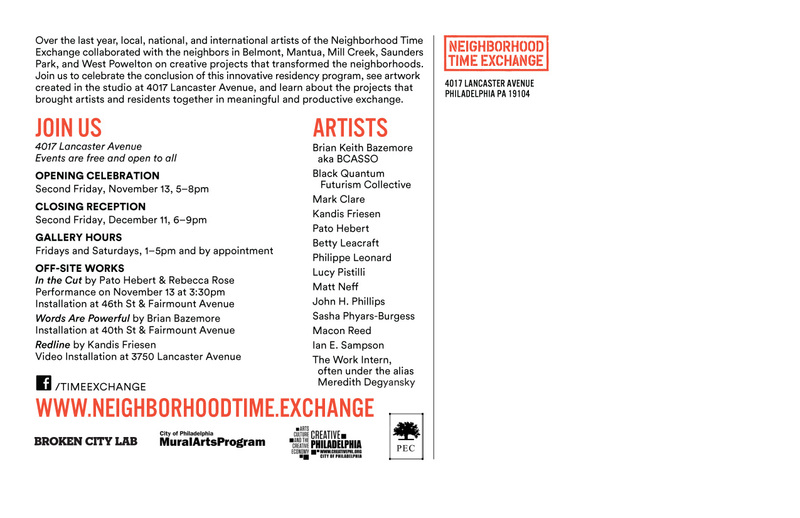 All are welcome to join us at 4017 Lancaster on Second Friday in November for a free public reception which marks the conclusion of the Neighborhood Time Exchange residency and celebrates the artwork created throughout the past year. The studio facility will be transformed into a group exhibition featuring works of art created by all 15 participating artists as well as documentation of community-based activities and service projects. This performance invites community members to reflect on that which has been lost, discovered, and created in their lives. A cut can be a loss, truncation or removal, but it can also be an opening, groove or release. Join us at 46th & Fairmount Avenue to experience a pathway cut into this grassy lot, extending to the center of the property where a large circle will welcome guests with music and conversation. This project invites community members to consider the both challenging and liberating changes that have occurred in their lives. JOIN US TO CELEBRATE THE ARTISTS AND PROJECTS of NEIGHBORHOOD TIME EXCHANGE TONIGHT! All are welcome to join us at 4017 Lancaster on Second Friday in November for a free public reception which marks the conclusion of the Neighborhood Time Exchange residency and celebrates the artwork created throughout the past year. 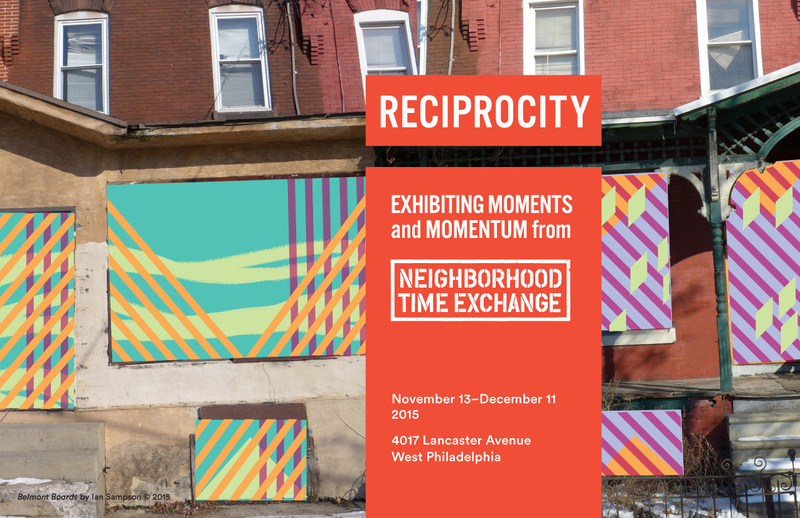 PHILADELPHIA – November 11, 2015 – The City of Philadelphia Mural Arts Program, The People’s Emergency Center, Broken City Lab, and The City of Philadelphia Office of Arts, Culture and the Creative Economy present their culminating exhibition: Reciprocity: Exhibiting Moments and Momentum from Neighborhood Time Exchange. The exhibition and final public events are the result of the ten-month Neighborhood Time Exchange residency, a residency in which selected local and international artists were given studio space in Philadelphia in return for their work on service projects for the West Philadelphia community. Three cohorts of artists participated in residencies between January and September 2015 and worked for spans of 1-3 months in a newly-renovated storefront space at 4017 Lancaster Avenue. Artists participating in the Time Exchange residencies received studio space, a monthly stipend, and basic tools and supplies. In exchange, artists contributed volunteer time to work with residents on their ideas to enhance their neighborhood. Throughout the Time Exchange, artists explored the complex and necessary role that responsible and accountable creative practice can play in a challenged and changing neighborhood. Media are invited to the exhibition opening on Friday, November 13, from 5-8 pm at the Neighborhood Time Exchange (4017 Lancaster Avenue) to meet the artists, partner organizations, and view the results of this unique artistic/community model. The exhibition runs from November 13 – December 11. A closing reception will be held on December 11 from 6-9 pm. The residency aimed to create a framework through which the resources of a neighborhood (the people, the history, and the experience of everyday life) could be understood as highly valuable components in revitalizing that neighborhood. By providing clear intersections and negotiations of time between local residents and visiting artists, Time Exchange cultivated a new dynamic role for creativity and reciprocity in a community’s rebirth and renewal. The neighborhoods targeted for Time Exchange are part of the West Philadelphia Promise Zone, which is a national initiative designed to provide communities of poverty with the chance for opportunity and success. The sections within the Promise Zone that Time Exchange focused on include Belmont, Mantua, Mill Creek, Saunders Park, and West Powelton. The Time Exchange project worked together with Promise Zone residents on revitalization projects to make a difference through art and community outreach. Each cohort of artists took part in open houses, exhibitions, and other events which created connections with the community. In addition, Second Friday events invited the public to enjoy local artists, entertainers, and restaurants along Lancaster Avenue on the second Friday of each month.